Weekend Slayer - Episode 4 - Gully's Stag: In this special episode, we head up to Bralorne Adventure Lodge for Geoff Gulevich's stag! Become part of Gully's crew, and witness the wild antics first hand. Katy Curd & Bruce Shred The Forest Of Dean: What came first, the chicken or the egg? Actually, who cares. Who's faster, Katy Curd, or her trail dog, Bruce? 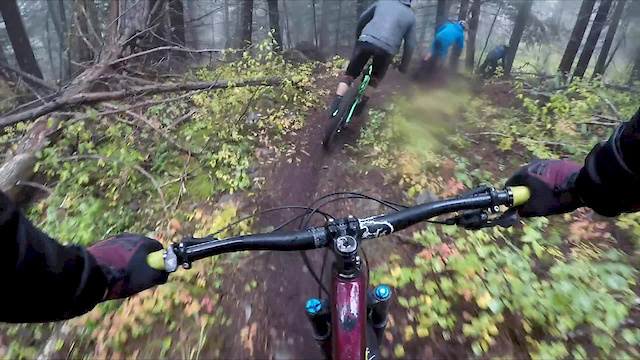 Summer's End: In September, the end of summer is upon us, Wesley Sherrell rides Black Forest Ham at Vedder Mountain. Cinema Reel: A collection of some of my favourite shots. Christian Davidson - 2018: Here are some shots of me riding my bike this summer. Chris Bennett - Golden: Chris returns to his home trails for some unfinished business. Good Times in Coastal BC: Just a little footy with the boys. Summer '18. Huey Walker - Race Prep: We tag along with Huey Walker as he prepares for the upcoming race race season by railing ruts, dropping boulders, and no handing natural kickers. Fred Vieira - 2019: This is the first edit of 2019, from Brazilian rider Fred Vieira. Unleashed: Unleashed is a short movie about mountain biking. Ludwig Jäger - Instagram Compilation 3: 2018 was a blast! I filmed more clips and jibs than ever before. Kriss Kyle - Dubai: Kris lands incredible stunts on his BMX across Dubai's most famous landmarks. Chris Haslam's "Sterling Golden" Part: Haslam has always owned his own wavelength, making the unbelievable somehow possible. His sorcery continues with this new mind-bending video part. Franky Villani's "Welcome to Dickies" Part: Franky flexes his eclectic bag of tricks with a jaw-dropping video part. Weird Waves Season 1 - Stream Tour Part 1: Join host Dylan Graves in what he is calling “The Stream Tour” which involves jumping in his van and driving to the midwest to hunt down rivers to go shred! In the first part of this two part episode, Dylan and Vans up-and-comer, Jett Schilling, link up with master river shredder, KB Brown as they break down two different river waves in Montana and Idaho. Lindsey Vonn - Carving a Legacy: Congrats on an amazing career. Friends of Shames: If your beloved ski hill ran out of money and had no choice but to close, what would you do? With time running out for majestic Shames Mountain in Northern BC, local skiers from Terrace, Prince Rupert, and Kitimat have decided to take matters into their own hands and buy the ski hill as a community co-operative. Friends of Shames: A Skier's Journey EP1 [Season 2] is a look into what's at stake for the people who call Shames home, and sheds light onto a different way of owning & operating a ski hill. And of course, there are plenty of deep turns and stunning terrain along the way. Grizzly Country: After serving in the Vietnam War, author and eco-warrior Doug Peacock spent years alone in the Wyoming and Montana wilderness observing grizzly bears. This time in the wild changed the course of his life. With the protection of Yellowstone grizzlies now under threat, Peacock reflects on the importance of habitat and why he continues to fight for wild causes.